Christmas tree themes can be simple and elegant, or extravagant, breathtaking displays. Here you’ll find a variety of tropical tree themes and Christmas ornament ideas for celebrating the holidays in tropical style. Tropical Christmas Tree Themes – What Are Your Options? If you’re reading this page, you are considering (or have already decided on) celebrating Christmas with a tropical decoration theme. Beach Theme Ideas – Incorporate beach elements for this decoration theme. 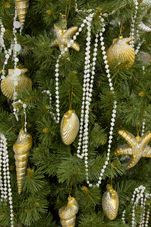 The best ornament ideas for this Christmas theme include seashells, pearls, coral, sand dollars, and starfish. Hawaiian Theme Ideas – Include Hawaiian flower ornaments, such as hibiscus, plumeria, orchids, and anthurium. Need more Christmas ornament ideas for this theme? Think Hawaiian traditions, including Hula dancing, luaus, floral leis, and surfing. Tropical Rainforest Theme Ideas – Leafy green foliage, bold colorful blooms, and exotic rainforest animals (colorful toucans and parrots, exotic frogs and butterflies, gorillas, monkeys, and lizards) are the focus of this tropical theme. Nautical Theme Ideas – Elements that reflect a nautical theme - rope, netting, and driftwood. Yachts, sail boats, lighthouses, ship wheels, life rings, anchors, and pelicans are perfect Christmas tree ornaments for a nautical Christmas theme. Sea Life Theme Ideas – The ornament list is long for a tropical sea life theme: clams, seahorses, starfish, crabs, sea turtles, octopus, lobsters, dolphins, manatees, colorful fish, and mermaids (to name a few). Vacation Theme Ideas – Re-live your tropical vacation or wedding during the holidays. Decorations for this Christmas tree include Hawaiian shirts, flip flops, surf boards, exotic cocktails, and ornament photo frames (for those tropical vacation and wedding pictures). Palm Tree Theme Ideas – Palm trees and coconuts are the order of the day for this Christmas tree theme. Exotic Bird Theme Ideas – Tropical birds are featured in this tropical theme. Choose colorful parrots, vibrant toucans, pink flamingos, breathtaking peacocks, and nautical pelicans for ornaments to decorate this tree. Hawaiian Santa Theme Ideas – Celebrate a tropical Christmas with Santa Claus! Christmas ornament ideas for this theme feature Santa and Mrs. Claus enjoying a tropical vacation. Mermaid Theme Ideas – These elusive sea creatures are elegant and whimsical. Decorate your tree with mermaid themed ornaments for a mystical Christmas tree theme. Disney Theme Ideas – If you’re a Disney fan, consider a tropical Disney theme. Popular tropical Disney themes to consider: The Little Mermaid, Pirates of the Caribbean, Peter Pan, Tarzan, and Lilo and Stich. For more Disney Christmas tree ideas, check out dream-disney-vacations.com.